Humans are highly skilled at sniffing out suitable sexual partners, research has found. Scientists have shown that natural body scent plays a key role in determining whether we find somebody attractive. Gay men were found to be particularly good at detecting the scent of other gay men. The research, by the Philadelphia's Monell Chemical Senses Center, will be published in the journal Psychological Science. 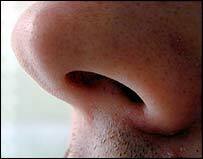 They found that homosexual men and lesbian women prefer different body odour from heterosexual men and women. In a second study using brain scans, researchers showed a chemical in male sweat stimulated the brains of homosexual men and heterosexual women in the same way. Natural scents, or pheromones, often do not register on a conscious level - but it has long been thought they probably have a big impact on behaviour. The Monell team asked a group of 82 straight and gay men and women to sniff underam sweat collected from 24 donors of different gender and sexual orientation. The preferences of gay men were strikingly different from those of heterosexual men and women, and lesbian women. Gay men preferred the odours of other gay men, and heterosexual women. The smell of gay men were the least liked by heterosexual men and women, and lesbians. Lead researcher Dr Charles Wysocki said: "Our findings support the contention that gender preference has a biological component that is reflected in both the production of different body odours, and in the perception of and response to body odours." In the second study, Swedish researchers looked at how the brain responded to two compounds suggested as potential pheromones - the testosterone derivative AND, and the oestrogen-like steroid EST. A total of 36 heterosexual men and women, and gay men were asked to smell samples of AND and EST, and ordinary odours such as lavender, while their brains were scanned. The scientists from the Karolinska Institute in Stockholm, found that AND activated a part of the brain called the hypothalamus in homosexual men and heterosexual women, but not in heterosexual men. EST activated the hypothalamus in heterosexual men alone. Animal studies have shown that the hypothalamus plays a major role in sexual behaviour. Writing in the journal Proceedings of the National Academy of Sciences, the researchers said: "These findings show that our brain reacts differently to the two putative pheromones compared with common odours, and suggest a link between sexual orientation and hypothalamic neuronal processes." Dr Nick Neave, a biological psychologist at Northumbria University, told the BBC News website that there was no doubt that pheromones played a key role in sexual attraction in animals. However, he said their role in humans was probably considerably more complex. "Studies have shown that spraying pheromones around does not elicit a specific behavioural response in humans. It is more likely that they are linked to subtle perceptual and behavioural changes," he said. Dr Neave said the detection of pheromones in animals had been linked to a specific organ in the nose - the vomeronasal organ. However, the same organ has not yet been found in humans.